VGA Splitters | Simply Connect Pte Ltd. The VS1204T A/V Over Cat 5 Splitter is a splitter designed to connect one source to 4 displays over a long distance. Incorporating suggested compatible receivers*. 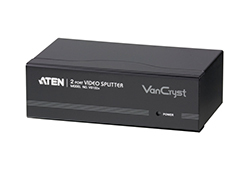 The VS1208T A/V Over Cat 5 Splitter is a splitter designed to connect one source to 8 displays over a long distance. Incorporating suggested compatible receivers*. The VS1504 Cat 5 Audio/Video Splitter is a splitter designed to connect one source to 4 displays over a long distance. Incorporating suggested compatible receivers. The VS1508 Cat 5 Audio/Video Splitter is a splitter designed to connect one source to 8 displays over a long distance. Incorporating suggested compatible receivers *. The VS82 Video Splitter duplicates the video signal from an input source (i.e. a computer) and route it to up to 2 display devices (monitors, projectors, etc.). However, they go beyond being merely duplicators, in that they also enhance the video signals over distances up to 65 meters. The VS84 Video Splitter duplicates the video signal from an input source (i.e. a computer) and route it to up to 4 display devices (monitors, projectors, etc.). However, they go beyond being merely duplicators, in that they also enhance the video signals over distances up to 65 meters. The VS88 Video Splitter duplicates the video signal from an input source (i.e. a computer) and route it to up to 8 display devices (monitors, projectors, etc.). However, they go beyond being merely duplicators, in that they also enhance the video signals over distances up to 65 meters. The VS92A is a video splitter that not only duplicates the video signal from any VGA, XGA, SVGA, UXGA, or multisync monitor to two outputs, but also boosts the video signal over a distance of up to 65 meters. The VS94A is a video splitter that not only duplicates the video signal from any VGA, XGA, SVGA, UXGA, or multisync monitor to four outputs, but also boosts the video signal over a distance of up to 65 meters. The VS98A is a video splitter that not only duplicates the video signal from any VGA, XGA, SVGA, UXGA, or multisync monitor to eight outputs, but also boosts the video signal over a distance of up to 65 meters. 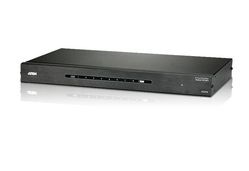 The VS132A Video Splitter is a boosting device that duplicates a video signal from one source to 2 output devices. Cascadable to three levels, the VS132A provides up to 8 video signals, in addition to extending transmission distance up to 30 m, making it excellent for public broadcast systems.